From day one we were asked by our team leader to be FAT. Of course I had already had a few Brazilian meals by that time and was definitely on board to be fat on this trip, but she had another meaning in mind. FAT: fluid, available and teachable. It seemed easy enough. Most mission trips require those basic qualities, but it was certainly harder than expected. We really had to learn to "let go and let God" because we never really knew what was in store for us from one day to the next. 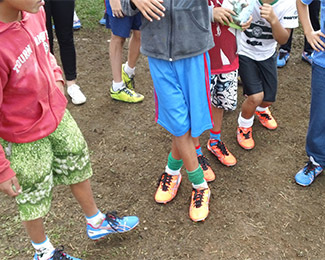 We were so blessed to work with Samaritan's Feet while in Brazil, an organization that distributes shoes to the local children. The best part about working with this group was not only that we gave shoes to the children but that we got to wash their feet first. It was an amazing experience to wash the feet of those children literally and symbolically just as Jesus washed his disciples' feet. John 13:6-7 says, "He came to Simon Peter, who said to him, 'Lord are you going to wash my feet?' Jesus replied, 'You do not realize now what I am doing, but later you will understand.'" These verses perfectly describe this whole journey. Most of the kids were very shy and sort of confused about why we were washing their feet. My prayer is that one day, they will remember the weird people in orange shirts who washed their feet, and they will be reminded of Christ. The last boy whose feet I washed literally asked me why would we give him new shoes, as if he didn't deserve them. The translator and I explained the story of Jesus washing the disciples' feet and that these shoes were a gift to him. After we talked with him, he told us that he was going to give his new shoes to someone else who needed them more. That was the most humbling and extraordinary moment for me during the journey. Matthew 18:2-4 says, "And calling to him a child, he put him in the midst of them and said, 'Truly I say to you, unless you turn and become like children, you will never enter the kingdom of heaven. Whoever humbles himself like this child is the great in the kingdom of heaven.'" There is nothing more pure and great as childlike faith. The experience was a reminder to humble myself daily. I am undeserving of all the blessings I am given, but God is truly always faithful. Please continue to pray for the children of Brazil, that they will find passions in life that lead them away from danger and that they will continue to hear and be touched by Christ. Pray for the missionaries in Brazil, that the World Cup will be an opportunity to share Christ with people from all over the world and that Christ will be glorified through this event. 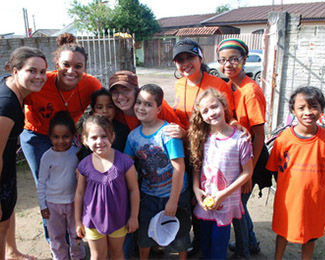 Azia is a student at Tarleton State University and served for 10 days this summer in Brazil.